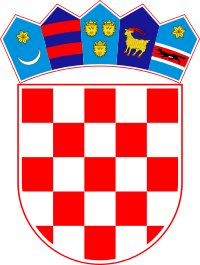 The Coat o airms o Croatie consists o ane main shield an five smawer shields which form a croun ower the main shield. The main coat o airms is a checkerboard (chequy) that consists o 13 reid an 12 siller (white) fields. It's commonly kent as šahovnica ("chessboard", frae šah, "chess" in Croatian) or grb (literally coat o airms). The five smawer shields represent five different historical regions that comprise Croatie. Wikimedia Commons haes media relatit tae Coats of arms of Croatia. This page wis last eeditit on 7 Mairch 2018, at 18:53.